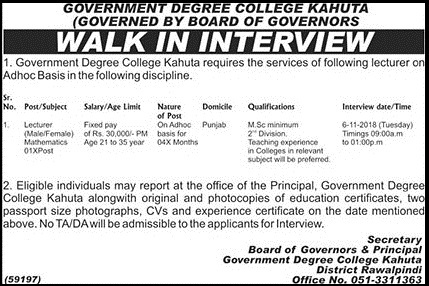 Government Degree College Kahuta District Rawalpindi Punjab. Qualification & Experience: M.Sc Mathematics (Minimum 2nd Division) Teaching Experience in Colleges in a relevant subject will be preferred. Eligible individuals may report at the office of the Principal, Government Degree College Kahuta along with original and photocopies of education certificates, two passport size photographs, CVs and experience certificate on the date mentioned above. Interview Date is Tuesday, 06 November 2018 - 09:00 am to 01:00 pm.